The Bananaquit And The Hummingbird. I sat one afternoon after lunch and sat, listening to the surf. 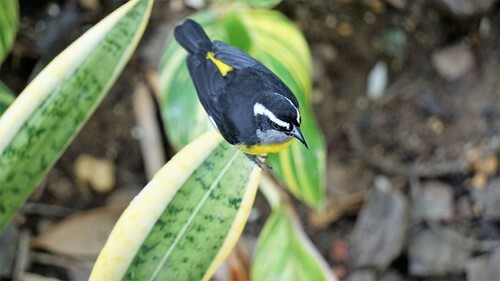 A bold bananaquit had grown used to me and would come within arms reach, whistling and studying me – unafraid even when I moved. He whistled loudly, either happily or voicing a complaint. After much song and the little hopping two-step dance of the bananaquit, he would go for the hummingbird feeder. 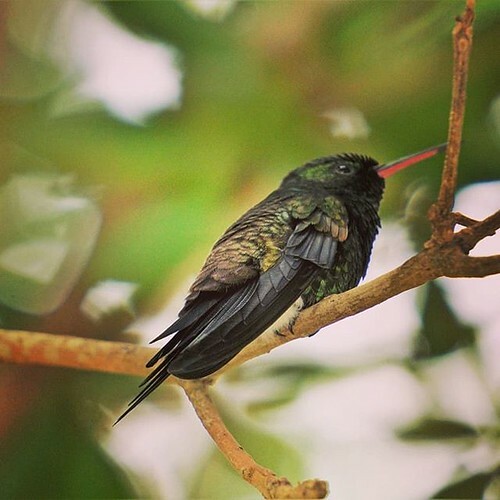 The ever-present hummingbird watched from it’s regular roost in a shrub in front of me, and would dart at the bananaquit – the bananaquit that was unafraid of me would fly off quickly to avoid the humming bird, looking for it, but unable to see it. I watched the hummingbird hover in the shade of a nearby tree, watching the feeder it had claimed. As the bananaquit would sing and dance toward it again, the hummingbird would dart at it again,so fast and precise. The bananaquit would again fly off. This process repeated itself in so many different ways – different directions, different starting points and ending points for both of them. The bananaquit could simply not get to the feeder, afraid of a bird even smaller than itself as I quietly chuckled at it’s many failures when trying to sneak into the hummingbird’s territory. I watched – they had been at it for an hour, and in heartbeats that must be the equivalent of days of their lives, perhaps even weeks. It might be nice to have a hummingbird to deal with all the noisy bananaquits in my life. Next > A Character Writing Itself.